Does anybody know what Lot Z021: Blank DTD on the recent Kaplan sale fetched? Lot WO10 from B91 in November 18, an unnamed DTD, sold for R7000 or £400. 1914/15 Star Pte J. Jack 5th M.R. QSA Bars Tvl; SA02 Pte F. Wilkie Scotish rifles Rank has been altered. Copy of Roll page confirms QSA and bars. GVIR Coronation medal unnamed but confirmed on roll. LG 11/3/1920 During operations near Develan Farm, on the 22nd March 1918 he displayed great gallantry in holding on the position with a Lewis Gun. Later, he held on to another position until darkness, when he fell back and helped to rally and reorganize the men. 337 Pte G. MORRIS Uitenhage V.R. and Marshall’s Horse with copy of Roll page. Bars confirmed with copy of the roll page. Tpr G.H. DYER Brabant’s H, and JHB Mounted Rifles with copy of the Roll pages. K024	Kings South Africa 14216 Pte H. HART R.A.M.C. 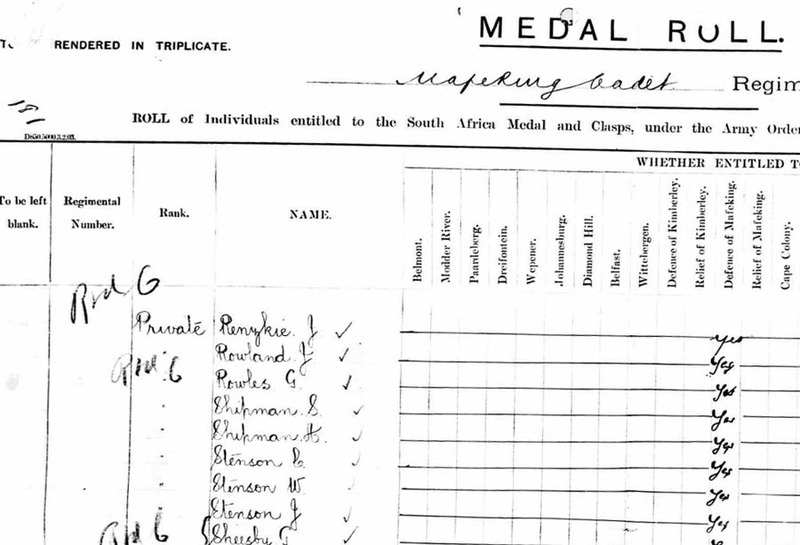 War and Bilingual Victory medal Copies of service record show that he was taken POW 21/03/1918. MIC confirms 34 BN MGC. 843 Tpr A. WOODROFFE Kitcheners F.S. Anyone know what the Mafeking Cadet Corp group went for? Edit: it was R34,000 so I was under bidder. Enjoy it whoever got it!